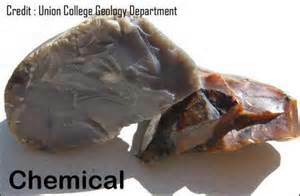 Basic purpose of this article is to discuss on Chemical Sedimentary Rocks. The commonest chemical sedimentary rock will be limestone. Composed mostly from the mineral calcite (CaCO3), limestones usually are formed by biochemical operations in shallow seawater. Coral and algae are specially important limestone builders. Different variations of limestone derive from the deposition and cementation connected with calcium‐rich shells, shell pieces, corals, algae, and the remains of tiny marine organisms.